It was a beautiful weekend in much of South Dakota, so much so that the lure of one last rockhounding trip was too much for me to pass up. With projected highs near 60, and just as importantly on the windswept plains of South Dakota, a lack of a wind, it seemed like the perfect day to roam around the Buffalo Gap National Grasslands. An added treat of birding the western part of the state at this time of year…all of the winter raptors that are arriving! I started out rockhounding, and could tell it was going to be a great day. I tried a little bit different spot, and immediately found it wasn’t as “picked over” as my typical spot near Kadoka. Right away I was finding many bubblegum agates, some beautiful rose quartz, some amber-colored honey agates, prairie agates, and some big chunks of petrified wood. I also found several coral and shell fossils, including one cute little bubblegum agate with a crisp imprint of a shell on the back side. The highlight…after only 10 minutes, I found a gorgeous Fairburn agate with an unusual, rosy-colored quartz center. That piece alone would have made the trip worth it. While I spent most of the day rockhounding, I also kept my eyes open for the arriving winter raptors. Rough-legged Hawks, as always, were in abundance in parts of the Grasslands. Ferruginous Hawks, Golden Eagles, a prairie falcon, and plenty of Red-tailed Hawks rounded out a day that finished with the spotting of a gorgeous, pure white, unbarred Snowy Owl on the drive back home. A great “last blast” out on the Grasslands, before the really cold South Dakota winter hits. A gorgeous Fairburn agate as I found it on the Buffalo Gap National Grasslands. On average this year, I’d say I find one Fairburn for about every 15 hours of looking, so it’s always a wonderful treat. This one was so unusual, in terms of that grogeous rosy center surrounding by the fortification banding. The material I brought back. You can collect on the Buffalo Gap National Grasslands, but 1) only for private collections (no selling of material), and 2) can collect up to 25 pounds of material in a day. Given I usually only keep the smaller pieces (most are 2″ or less), that’s not a problem! But on this day, there were some BIG pieces of petrified wood I was tempted to bring home! If I had done so though, a couple of them would have used up my 25-lb allotment! Hence sticking with my “usual” agates and other material. Finding Hidden Treasures – Fairburn Agates! 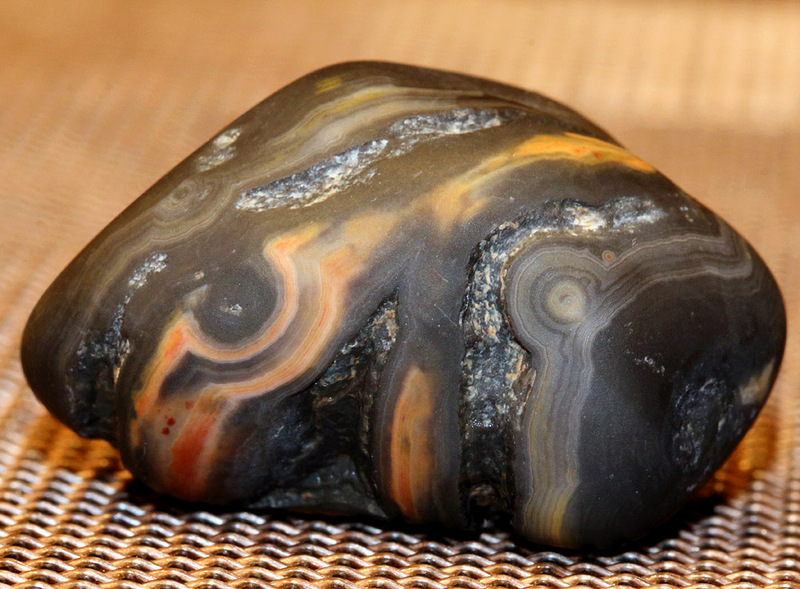 The partially polished Fairburn Agate, with the black outer layers being worn away, starting to reveal the beautiful, characteristic banding pattern of a Fairburn Agate underneath. 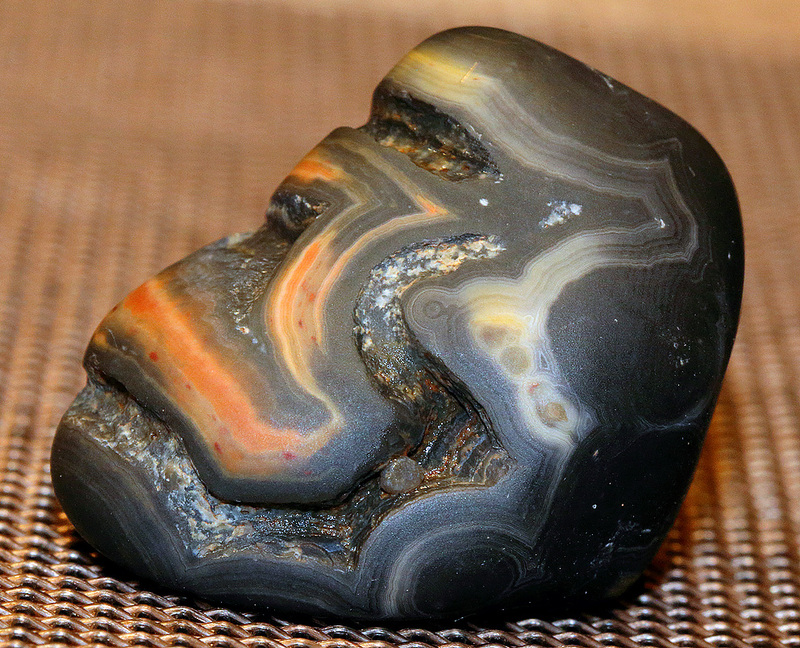 In this “profile” view, you can perhaps see why my son and I have dubbed this the “Easter Island Head” agate. My son and I have have been bitten hard by the rock-hounding bug. We’re newly infected…we’ve only made two excursions in search of geologic wonders…but I fear a lifetime affliction may be forming. In those two trips, we went to an area of the Buffalo Gap National Grasslands where you’re allowed to collect agates, jaspers, petrified wood, or other geologic finds. The variety (and beauty) of rocks and minerals you find in the area is astonishing. 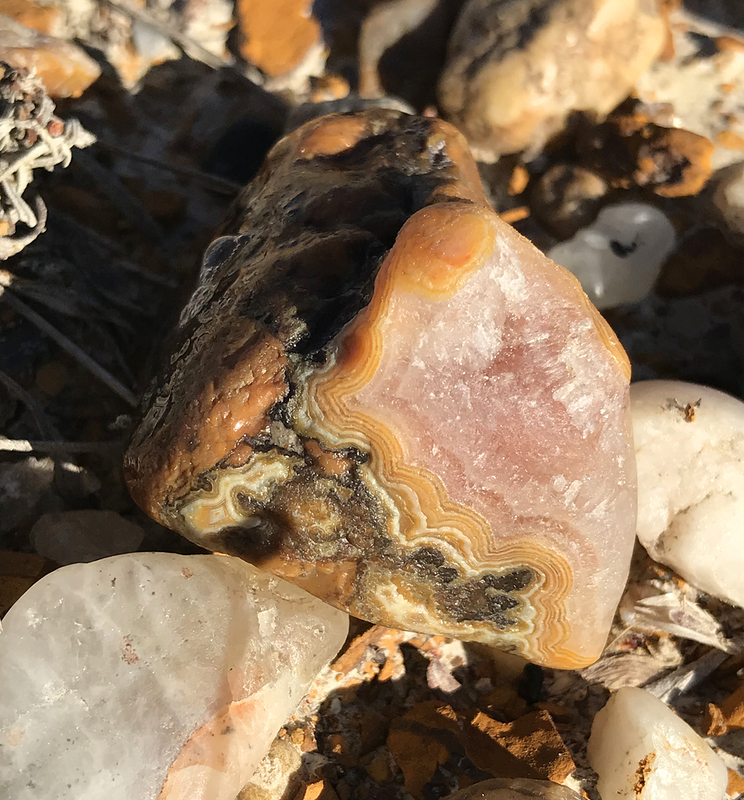 While we’ve certainly had a blast and had some wonderful finds, so far we have struck out on finding the “Holy Grail” of agates…the famed Fairburn Agate. Fairburn Agates are one of the world’s most famous, and they’re found only here in South Dakota. They have an incredible fine, even banding, often displaying an incredible array of different colors. They were originally identified near Fairburn, South Dakota, on the outskirts of the Black Hills. However, they can also occasionally be found elsewhere in southwestern South Dakota, including the area of the Buffalo Gap National Grasslands where we have been searching. 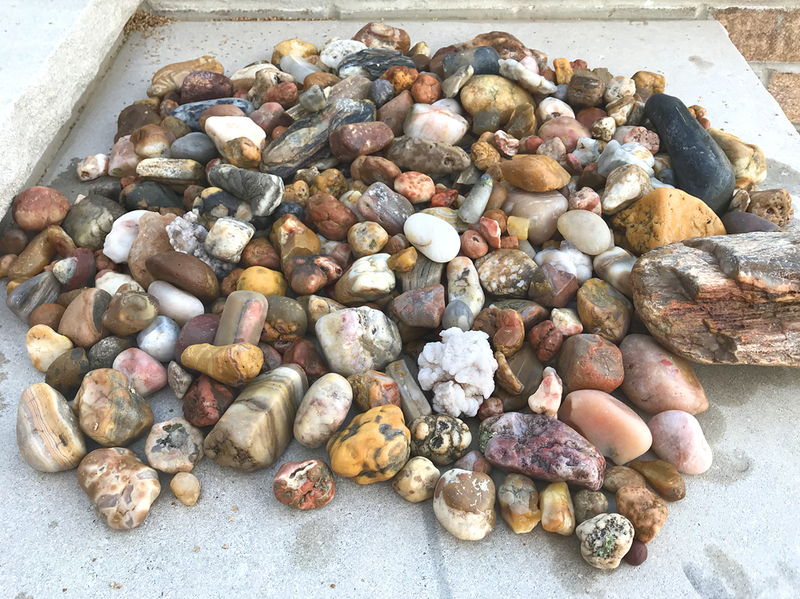 In our two trips, we hadn’t identified any Fairburn agates, but we’ve certainly found our fair share of prairie agates, bubblegum agates, rose quartz, and petrified wood. All of these are very beautiful in their raw state, but we’ve also purchased a rotary tumbler for polishing our finds. We had our first batch going in the tumbler, and last night was the first “reveal”. It’s only the first “rough” stage of polishing, meant to round off and shape stones, so there are at least couple weeks of more polishing before this first batch is in their final, lustrous form. However, in this first batch we had a major surprise…a simply GORGEOUS Fairburn Agate! On our last trip, we found a small (1 1/2″), egg-shaped stone with a very irregular outer surface. It was entirely coal black, without a speck of color, without a trace of banding. However, it was one that we threw in with our first polish batch. The rough shaping and polishing has started to wear away the black outer layer, revealing the gorgeous Fairburn patterns underneath! We are going to put the agate through the rough polish stage again to wear away more black and reveal more of the inner Fairburn pattern. We also have another, very similar stone (photo below) that I suspect is also a Fairburn. SUCH FUN! SUCH EXCITEMENT, to open the polisher for the first time and see the transformed agates and stones. A full-sized view of the “Eastern Island Head” agate. 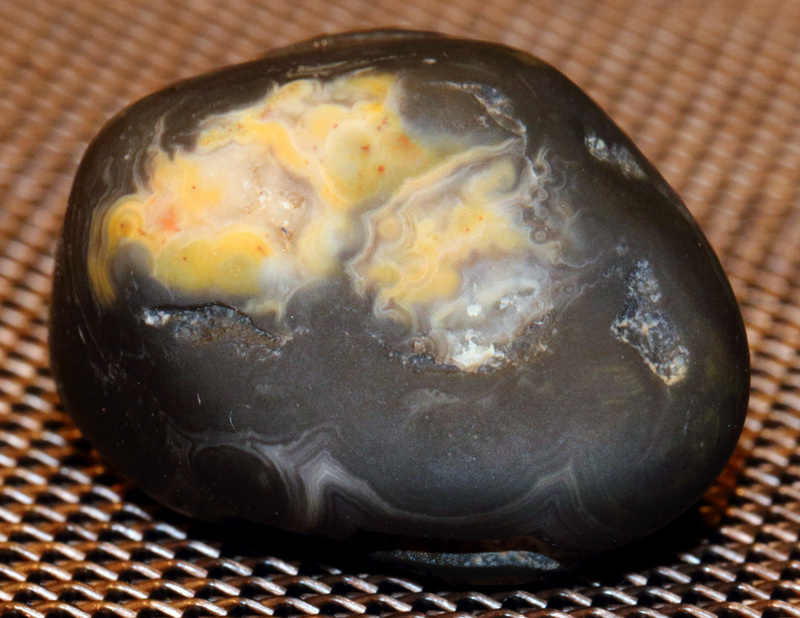 None of the colors or banding here was visible until the agate went through the “rough” polishing stage for 8 days. Another view of the Fairburn, on the opposite side of photo #1. Similar beautiful banding patterns, with several “eyes”. The “Back side” of the Easter Island Head agate. It’s quite evident that everywhere the black outer layer is worn down by the polisher, a gorgeous Fairburn pattern is revealed underneath. Another agate from the Buffalo Gap National Grasslands, with a similar shape and size. 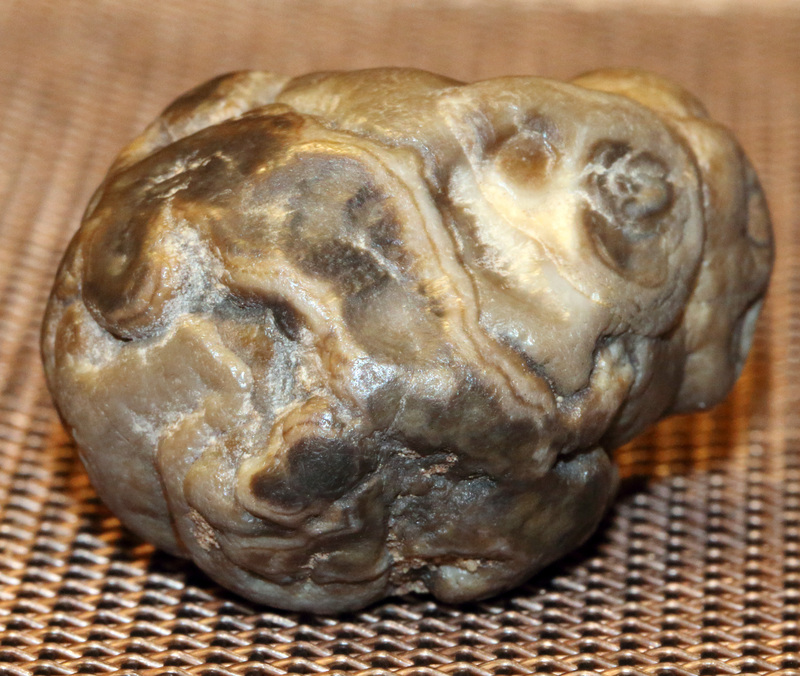 It lacks the overall dark coloring of the “Easter Islands Head’ agate, but you can see a hint of a Fairburn pattern in the pebbly outer shell of this one as well. This one is also headed to the polisher, and my guess is that polishing will also reveal a beautiful Fairburn underneath.